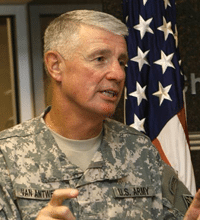 VanAntwerp retired from the Army after 39 years of service and most recently served as chief of engineers and commanding general of the US Army Corps of Engineers (USACE). He was the senior military officer overseeing a $40+ billion program including most of the nation’s civil works infrastructure and military construction on 250 Army and Air Force installations worldwide. As the USACE commanding general, he was responsible for over 37,000 employees who provided engineering, project management, construction, and operation and maintenance support in nearly 100 countries around the world. As the highest honor given by the regiment, the Gold de Fleury medal is named after François de Fleury, a French engineer who served the Continental Army during the American Revolution, and who displayed valiant courage in the battle of Stony Point in 1779. On October 1,1779, de Fleury stood before the Continental Congress and received praise by the men who had penned the Declaration of Independence and who would later sign the Constitution. For his fearless actions, the Continental Congress ordered that a medal be struck in his honor. It is understood that the de Fleury Medal was the first Congressional Medal struck, if not the first medal authorized. VanAntwerp was named a 2015 Gold de Fleury medal recipient along with retired brigadier general and Department of Civil and Environmental Engineering (CEE) Research Professor, Gerry Galloway. VanAntwerp and Galloway received the medals in Arlington, Virginia on August 7th, 2015 at the US Army Engineer Regiment’s 147th Annual Engineer Castle Ball. “They are accomplished men who gave much to the nation both during and after their military careers and represent the best of the US Army Corps of Engineers and the Engineer Regiment,” said LTG Tom Bostick, 53rd Chief of Engineers. The Engineer Regiment adopted this medal as an award because the values demonstrated by de Fleury are of special meaning to engineer soldiers. The Gold de Fleury Medal recognizes those who have provided significant contributions to Army engineering, and who exemplify boldness, courage, and commitment to a strong national defense. The Engineer Regiment also awards three other levels of the de Fleury Medal. The STEEL Medal is awarded to junior soldiers and civilians within the Engineer Regiment; the BRONZE Medal, for an individual who has rendered significant service or support to an element of the Engineer Regiment; and the SILVER Medal, for an individual who has rendered outstanding and significant support or service to the Engineer Regiment. Past recipients of the Gold de Fleury Medal include Dr. Ed Link, CEE Senior Research Engineer, the late Ike Skelton, former US Representative for Missouri’s 4th congressional district, Daniel Inouye, former US Senator from Hawaii, and John O. Marsh, Jr., former U.S. Representative for Virginia’s 7th congressional district and former Secretary of the Army. The Army Regimental System was developed to emphasize the history, customs, and traditions of the Corps. Maj. Gen. Daniel R. Schroeder, then Commanding General of Fort Leonard Wood and Engineer School Commandant, wanted an award to tie in the beginnings of the nation and the Army Corps of Engineers. R.L. “Van” VanAntwerp, Jr., LTG (R) was awarded the prestigious 2015 Gold de Fleury Medal by the U.S. Army Engineer Regiment. VanAntwerp, Jr. retired from the Army after 39 years of service and most recently served as Chief of Engineers and Commanding General of the U.S. Army Corps of Engineers (USACE). He was the senior military officer overseeing a $40+ billion program, including most of the nation’s civil works infrastructure and military construction on 250 Army and Air Force installations worldwide. As the USACE Commanding General, he was responsible for over 37,000 employees who provided engineering, project management, construction, and operation and maintenance support in nearly 100 countries around the world. In July 2011, General VanAntwerp was appointed Chief of Infrastructure and Executive Development for the Flippen Group. In addition to serving clients as a senior consultant, Van leads the new Infrastructure Group that works with other organizations to develop teams and acquire resources needed to rebuild roads, waterways, schools, and utilities that are critical to improving the fabric of society. VanAntwerp, Jr. was named a 2015 Gold Medal recipient along with retired brigadier general and Department of Civil and Environmental Engineering (CEE) Research Professor, Gerry Galloway. VanAntwerp and Galloway received the medals in Arlington, Virginia on August 7th, 2015 at the U.S. Army Engineer Regiment’s 147th Annual Engineer Castle Ball. “They are accomplished men who gave much to the nation both during and after their military careers and represent the best of the U.S. Army Corps of Engineers and the Engineer Regiment,” said LTG Tom Bostick, 53rd Chief of Engineers. Past recipients of the Gold de Fleury Medal include Dr. Ed Link, CEE Senior Research Engineer, the late Ike Skelton, former U.S. Representative for Missouri’s 4th congressional district, Daniel Inouye, former U.S. Senator from Hawaii, and John O. Marsh, Jr., former U.S. Representative for Virginia’s 7th congressional district and former Secretary of the Army. Lieutenant General (R) R.L. VanAntwerp is the Chief of Infrastructure and Executive Development at the Flippen Group.